When the Museum of Natural History is closed for upgrades and renovations, the museum pieces are moved into federal storage at the famous Washington Museums. The centerpiece of the film will be bringing to life the Smithsonian Institution, which houses the world's largest museum complex with more than 136 million items in its collections, ranging from the plane Amelia Earhart (Amy Adams) flew on her non-stop solo flight across the Atlantic and Al Capone's (Jon Bernthal) rap sheet and mug shot to Dorothy's ruby slippers, Fonzie's jacket from Happy Days, the still from M*A*S*H and Archie Bunker's lounge chair from All in the Family. 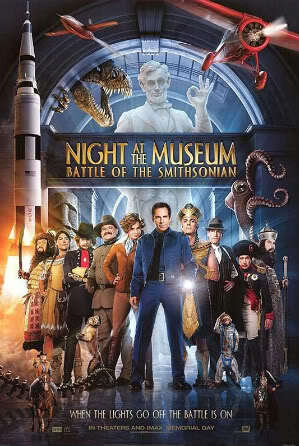 After stealing a security guard's ID badge, Larry (Ben Stiller) slips into the Archives of the Smithsonian, where Kahmunrah, an evil Pharaoh will come to life with the reestablishing of a tablet as a magical force in the museum bringing the old exhibits (Such as Theodore Roosevelt and Dexter) and new exhibits (like General Custer and Al Capone) back to life, and in conflict with each other. Larry enlists the help of Amelia Earheart, who he develops a romantic interest in, and together they try to put everything back in order.